The single luxury champagne gift box sets from Gifts International bring an additional presentation element to a champagne gift. UK and worldwide delivery. Gifting a bottle of champagne is both classy and thoughtful — we stock only the highest quality champagne to ensure your gift is more than appreciated. A luxury item calls for luxury gift options, and our single luxury champagne box looks fantastic. Made from silky oak, our boxes are lined with grey satin, with neat metal clasps to keep the boxes sealed when not in use. 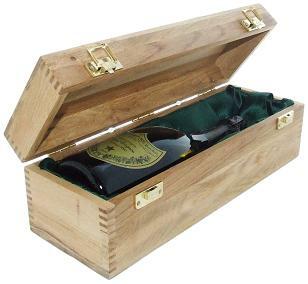 If you are looking to gift more than one bottle of champagne, check out our twin luxury champagne boxes. Alternatively, browse our full range of champagne gifts where you can choose the luxury drink by brand or with other indulgent items such as chocolates or ice buckets. All of the items at Gifts International are available for delivery in the UK and worldwide.